A Reporter Looks At Where Egypt May Be Headed Reporter David Kirkpatrick, the Cairo bureau chief for The New York Times, reflects on his time reporting on the Arab Spring and discusses what the election of President Mohammed Morsi means for Egypt, the United States and Israel. 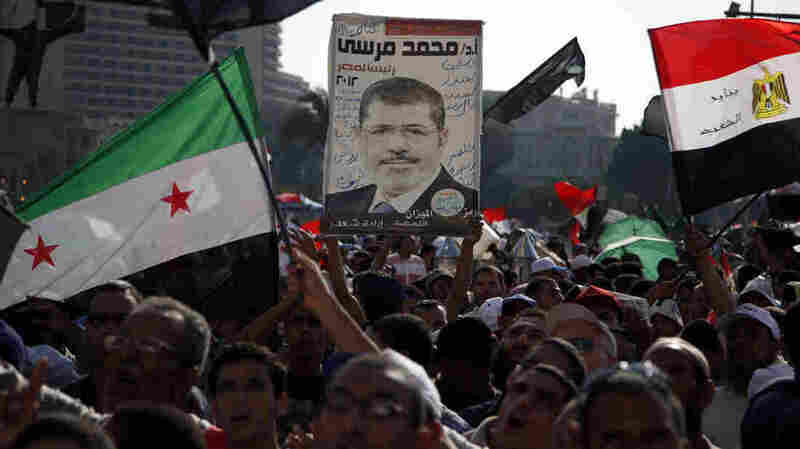 Demonstrators chant slogans supporting Egyptian President Mohammed Morsi during a rally in Tahrir Square in Cairo on Friday. 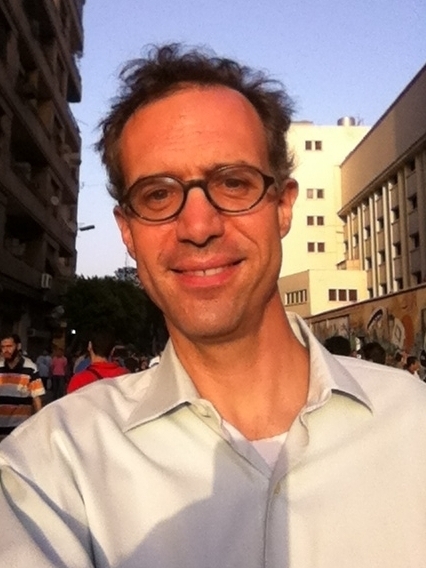 New York Times reporter David Kirkpatrick standing in Cairo's Tahrir Square. Reporter David Kirkpatrick covered Washington's political scene for many years for The New York Times. But early last year, he decided that he was ready for a change of scenery. Kirkpatrick volunteered to move to Egypt to become the Times' Cairo bureau chief — and boy, was his timing good. "I was on duty in Egypt beginning Jan. 9, 2011," he tells Fresh Air's Terry Gross. "Jan. 10, I arrived in Tunisia, where someone had killed himself burning himself alive. And on Jan. 14, four days later, the president of Tunisia fled. And then the whole region was up in flames." Kirkpatrick describes the past 18 months as a "complete adrenaline rush." After Tunisia, he went back to Egypt, where he reported from Cairo's Tahrir Square and then from across the country. Most recently, he has been covering the election of Mohammed Morsi, the Muslim Brotherhood figure who was sworn in as Egypt's first democratically elected president two weeks ago. On Wednesday's Fresh Air, Kirkpatrick discusses what Morsi's election means for the U.S. and Israel and talks about his own experiences in Egypt. "I've ended up doing things that I never thought I could do, whether they're as simple as living for a week without running water after the fall of Tripoli, sleeping a lot less than I thought I could and making a lot of decisions a lot faster than I thought I could," he says. "All of that is pretty mundane. The truth is that I'm still too close to it and too far into it to know what it's going to mean for me," he adds. "It's much more fun than I thought it would be. I knew it would be interesting, but I had no idea that I would have a ringside seat on this kind of transformative moment in the history of the world." "Women's rights in Egypt today are in a pretty crummy situation as it is. So, it's not like this is a particularly liberal cultural climate that might move into reverse gear. It's an extraordinarily traditional culture, especially outside of the small Westernized elite in Cairo. ... So, in a sense, it's not like they've got a lot to lose. If I were to guess about where the Brotherhood is going on these questions, they've said a lot of positive things about equal opportunity for women and allowing women to have opportunities and participate fully in the nation. Their ideology is conservative, much like the ideology of religious conservatives in this country in that they think the normal order of things is for women to stay home and take care of their children where that's possible. In Egypt today, it's not that possible, because many women have to work outside of the home for income. So one wonders if when [the Muslim Brotherhood is] in charge of the state, they'll start baking those traditional messages into the cultural ministries or education ministries, but certainly they've given no intention right now that they have any plan to do that." "They're proud of the election of President Morsi, and they consider it evidence that they have completed their promise to hand over full power. Now, this is absurd. It's completely and totally false in a kind of 1984/Through the Looking Glass way, because on the eve of his election, they also dissolved the Parliament and issued a decree claiming for themselves not only all legislative authority but all authority over the budget. So they've left him all but powerless. So we're in a kind of bizarre alternate universe in Egypt right now where the nominal president isn't really the president, and you can tell because the state media is constantly trying to undercut him whenever he tries to challenge the ruling generals." On the term "Facebook revolution"
"I hate this Facebook revolution stuff. I really strongly object to it. You can sit at your computer all day long, and you're never going to get anything done in terms of bringing down a government. What happens is when people got up and went into the streets. So Facebook and Twitter have some advantages as organizing tools — they're definitely an advance over putting up a flier or putting up a pamphlet — but they're similar to that. It's a change in kind. To put the technology in the forefront and not the individuals really misses the point. And in Egypt, some people suspect that when the West characterizes it as a 'Facebook revolution,' what they're really trying to do is put the Western brand name that we know front and center — that we're projecting our own Western ideas onto it and inserting ourselves into the picture, which they don't like. That said, these things are pretty nifty, and especially in Tunisia and Libya, Facebook continues to play an important role as a source of news."